One cat can have up to three litters a year – averaging about five kittens per litter. I would just like to write in praise of the Esther Honey Foundation. The service this foundation offers our island is just so valuable! I have had a cat trap from them now for the past year, and have used it to catch stray cats around our house. I take them in to Esther Honey for de-sexing, so they can no longer contribute to the wild cat population that is so high on our island. I have caught about eight female cats so far, each of which could have had litters averaging around five kittens per litter, three litters per year. So, that’s 120 cats per year. And of course this multiplies down the family tree, as each female (let’s say 50 per cent, so 60 cats) from these yearly litters would within a year contribute another 15 cats each to the population. So now Esther Honey have stopped 900 stray cats from entering the cat population by next year just from my feeble contribution. (I was always good with mental arithmetic!). According to Mr Google (who knows everything!) one female stray cat in their reproductive lifetime can contribute 420,000 cats to the cat population! 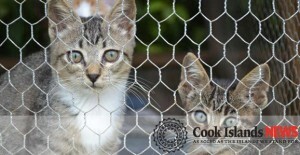 So Esther Honey have already dealt with over 3 million potential cats in Rarotonga, from my catch alone! Esther Honey have more traps, so anyone else want to help out? Keep up the good work Esther Honey, you are doing Rarotonga a fantastic service.